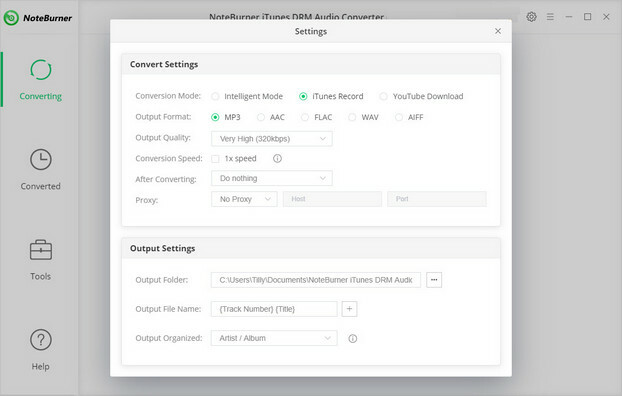 Through continuous customer oriented research and development, NoteBurner Inc. finally released a new program to help people convert Apple Music files - iTunes DRM Audio Converter for Windows & for Mac. In addition to allowing you to convert DRM-ed Apple Music files, the program can also help you convert DRM-ed M4A/M4B/AA/AAX audiobooks, DRM-ed M4P audio files and other DRM-free audio files. Don't hesitate, free download the program for a try and get it now! Note: If you want to convert Spotify music to MP3, AAC, FLAC or WAV, please refer to NoteBurner Spotify Music Converter. 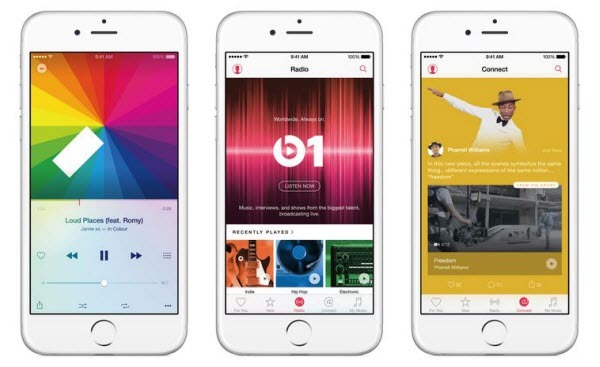 Apple announced the long-awaited Apple Music in WWDC 2015, a new all-in-one app and service for discovering and listening to music which is the product of Apple's $3 billion acquisition last year of Beats Entertainment. Then, what is Apple Music? Music is one app, but it's actually three distinct things – Apple Music, Apple Music Radio and Apple Music Connect. And it's the combination of the three that Apple is betting represents the future of the music industry, the "one complete thought around music" that Cupertino thinks the world has been waiting for. Now, let's explore together what do you need to know about Apple Music? What do you need to know about Apple Music? The Apple Music service comes with a free 3-month trial and subscriptions start at $9.99-a-month or $14.99 for up to six family members. Apple Music is available for iPhone, iPad, iPod Touch, and Macs starting June 30, 2015. It will be offered on the Apple TV set-top box and Android devices in the fall. Offline listening: Paid Apple Music users will be able to download albums and playlists for offline listening and take it on the road, while free users will only be able to listen to Apple Music radio stations with limited skipping. Vast resource accessing: Apple Music allows users to access iTunes's vast library of music, boasting 40 million songs, as well as tune into an exclusive 24-7 global radio station, Beats 1, which is a live 24-hour radio station broadcasting to 114 countries from Zane Lowe in Los Angeles, Ebro Darden in New York and Julie Adenuga in London. Easy music discovering: The app gets to know your preferences and generates recommendations from experts who know and love music based on what you normally listen to, as well as the input of. That's in the "For You" section. Meanwhile, Siri gets into the action, too. You can use voice prompts to find a play tracks with Siri on the virtual ones and twos. Musicians and fans interacting: The Apple Music Connect section serves as a social network for artists to share lyrics, backstage photos, songs and videos with their fans. 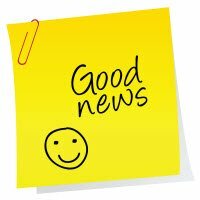 In this way, musicians and fans can interact -- listeners can comment and artists can respond, plus anything posted is shareable on Messages, Facebook, Twitter and email. People who choose not to subscribe can follow artists and view their feeds, but only paying members will be able to play and save Connect content. Apple Music allows paid users to save the music for offline listening and take it on the road. It will be great if you can convert Apple Music to MP3 format. In this way, you can retain the music you love and even you can play the Apple Music in other devices. 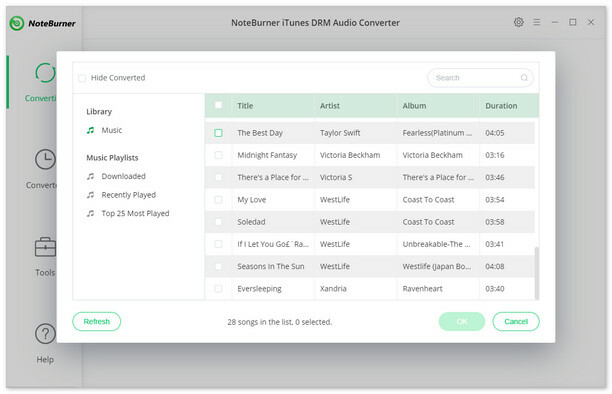 To convert Apple Music Files, NoteBurner iTunes DRM Audio Converter for Windows & for Mac comes to rescue. How to Convert Apple Music to DRM-free MP3? Want to convert the downloaded Apple Music files to other formats for use on any computers or mobile music devices such as iPod, PSP, Zune, iPhone, cell phone, MP3 player, MP4 player etc? Then you will need NoteBurner iTunes DRM Audio Converter (for Windows & for Mac), which can convert Apple Music, iTunes DRM-ed M4P, M4B, M4A, music to plain MP3, AAC, WAV or FLAC. The following is a detailed tutorial on how to convert Apple Music files to MP3 with NoteBurner iTunes DRM Audio Converter. Please download this useful tool on your Windows PC or Mac first before getting started. Related Article: How to Burn Apple Music Songs to CD? On the main window of NoteBurner iTunes DRM Audio Converter, click the Add button, a dialogue box will pop-up. You can add Apple Music files, audiobooks, and M4P audio as you want. To convert Apple Music files, please add Apple Music files into the program. Click the "Setting" button on the main interface, and then there will be a pop-up window which allows you to set output path and output audio format. If you do not change output path, the output audio will save in the default folder. You can convert your DRM-ed Apple Music to plain MP3, WAV, AAC or FLAC for enjoying anywhere and anytime. When finish customization, click "Convert" button to start converting. If you don't want to convert certain music, please click "remove" button to remove this music before converting. After conversion, click the "History" button in the main interface to find the output audio. Now the iTunes DRM-ed music you've downloaded have been converted to MP3 format, you can import the MP3 music to any other devices for enjoying. Please Note: We offer free trial for all users to experience NoteBurner iTunes DRM Audio Converter before you buy the program. But the free trial version has 3-minute limit on converted files. To unlock the time limitation of the free trial version, you can purchase the full version.